Hopside Down is looking to be a hot destination inside one of the Third Ward&apos;s hottest destinations. Published Nov. 9, 2018 at 7:01 p.m. When it comes to hidden gems in Brew City, the Milwaukee Ale House isn't one. A gem? Absolutely. Ever since the Third Ward bar and restaurant opened as a Milwaukee Brewing Company alcove in the late '90s inside the century-old Saddlery building, it's been recognized as a staple of the neighborhood and consistently one of its popular spots – whether going for a beer, a bite or a battle of either sporting prowess on one of its TVs or of wits on one of its trivia sheets. But hidden? Absolutely not. That is … unless we're talking about the intimate, cozily quaint and quiet bar at Milwaukee Ale House. No, not the main bar, the one right in front of you as you walk in the door, sitting at the epicenter of the action with room to accommodate 200 people. 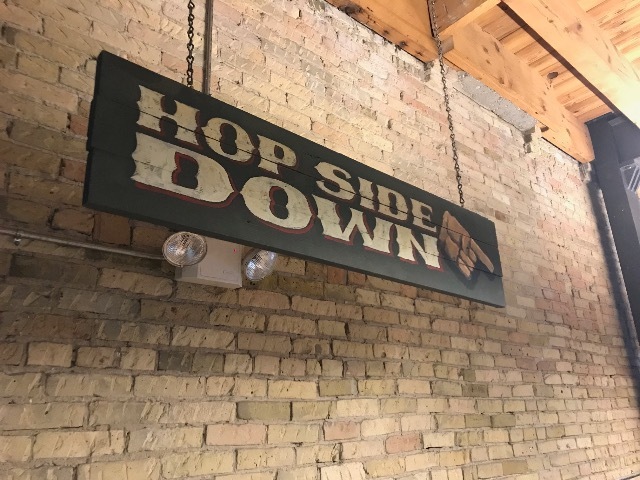 I'm talking about the otherbar – the one that holds a quarter of the patrons of its upstairs neighbor, the one that requires a respectable quest to find and the one that might just turn your impressions of the big, bustling Third Ward bar upside down: Hopside Down. 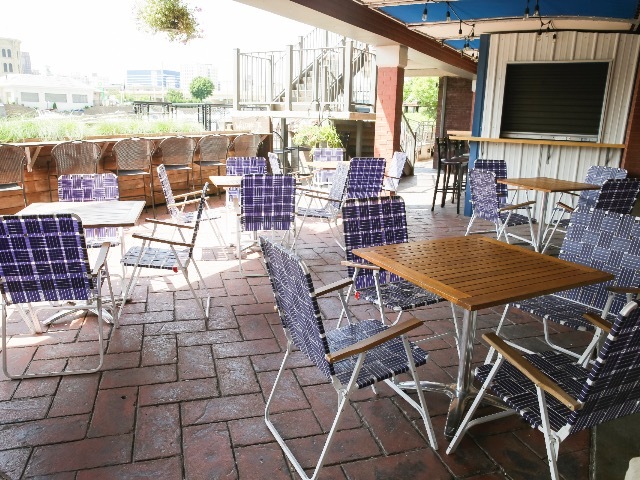 "Hopside was originally built as the service bar for the lower deck in the summer, but we quickly expanded it to handle a quieter spot on the river when the rest of the Ale House is rockin'," said owner Jim McCabe. "The idea is all the things you love but a more intimate hangout." Unlike the rest of Milwaukee Ale House, it takes some effort to find its snug little sister bar. You can wind around the main restaurant, going through every room until exiting through a door into a clean corridor where you take some stairs down to your downstairs destination. Or you can enter through a completely different door to the Saddlery building than the Ale House's main entrance, walking through some business-looking hallways before reaching the stairwell. The easiest way might actually be by boat – at least during the warmer seasons when the docks are on the river. "All the time, we'll tell people upstairs coming in for just a beer and a seat on the patio, 'You might like it downstairs,' and they'll say, '…Downstairs?'" joked Manda Gill, events coordinator for the space. It's a place you look for, not that you simply find – but no matter how you hunt down Hopside Down, it's worth the discovery. Compared to the large, lofty space upstairs, Hopside Down is adorably cozy, holding just around 50 guests – a fourth of the main hall's patrons. The comfortable atmosphere isn't just because of the tighter quarters, either, as the pub is warmly decorated with a rich wooden bar, earthy tones and, of course, classic Cream City brick. "Cozy is the perfect word," Gill said. "Real estate agents use that word to say 'tiny,' but that's not a bad thing when you're talking about a bar. People tend to really like this space because it's intimate, because it feels like Milwaukee and because we have really good beer. To wash down your beer – mostly Milwaukee Brewing Co. taps with other liquors and beers available as well – and maybe a meal from the Ale House's full menu with a breath of fresh air, guests can also pop onto the patio, where there's plentiful seating, a lovely view of the Milwaukee River and, during the warmer months, actual hop plants growing in the gardens and winding their way up its pillars. 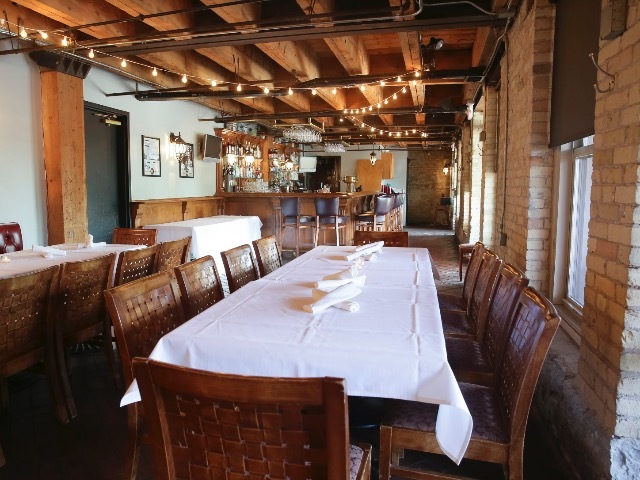 Unsurprising considering its intimate yet open layout, homey aesthetics and secluded location, Hopside Down often serves as a special event space for work meetings, family gatherings and especially wedding parties and practice dinners. "Most of these events that we have are really, really important for these people," Gill explained. "You go into work, you have a regular day, you sit at a desk, you walk around – it's just a day. But for them, it's absolutely not. And you have to remember that. "We had a fun rehearsal dinner recently: The bride wanted a Harry Potter-themed wedding, and the groom was a fan too, but that's not what they went with. But her parents wanted to surprise her and have the rehearsal dinner be Hogwarts-themed, so they hung the Hogwarts banners along the rafters and had pumpkins on the tables and wands and golden snitches. Then we played the Harry Potter theme song when they came down the stairs and surprised her. It fits the space; it kind of moldable." "It's established that we do events down here and we do them well," Gill said. "It's getting it non-summer, non-busy times to get people to pop in and see what it's like."